"The Quest for Cosmic Boy: Lord of Lightning - Part 2 of 2"
Search teams 1 and 2 (who are out looking for Cosmic Boy) are locked in combat... but spare them not another thought, for that's all you'll hear about them this issue! Mostly. Underground on Winath, Star Boy, Sun Boy and Mekt are confronted by Mekt's parents and others, and Star Boy quickly increases the gravity to incapacitate them. Star Boy asks about the bio-electrics they seem to have, wondering if that's how they're replicating Mekt's (and Lightning Lad's) powers, when the Mayor says that they brought back Mekt, the prodigal son of Validus, the Lord of Lightning, and so they are no longer needed and attacks Star Boy, knocking him out. Mekt and Sun Boy seem to think Star Boy is dead, and they take off in search of Tenzil Kem, who Mekt is sure is involved somehow. Tenzil, meanwhile, escapes from the grain silo he was imprisoned in... with a loud belch. Yessir, it's the new Matter-Eater Lad. Back on Earth, the Wanderers want a word with Brainy, as they think he specifically sent Mekt to a place where they couldn't contact him, and Invisible Kid fears they'll get violent. Brainy tells them Supergirl chose the teams and where they were going, although another Coluan, Vrax Gozzl (who is a member of the Wanderers) doesn't believe it. Brainy then leaves, with a pointed comment about Vrax's mere tenth-level intellect and the inadequacies thereof. 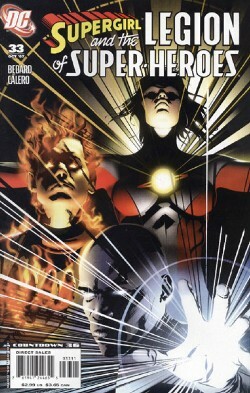 On Winath, Sun Boy and Mekt discuss things and figure Mekt's parents and the mayor, et al, have been forced to act as part of the cult of Validus and have been given their lightning powers due to nano-capacitors in their bloodstream... the leader of such tech being the planet Colu. Kem catches the kids who locked him in the grain silo as they are dragging off the unconscious Star Boy, and frees him. Mekt and Sun Boy are getting attacked by Mekt's parents, and Mekt, fed up, attacks his own father, severely wounding him. Mekt and Star Boy find a transmitter that's controlling the people of Winath and destroy it, freeing them from the "cult" and returning them to normal. Kem confronts Mekt, saying that he scanned the transmitter and it had a signature of its Coluan creator. Mekt thinks it must have been Brainy, but Kem reveals it was, in fact, Vrax Gozzl, and Kem is convinced he was acting under orders from Mekt. Mekt gets angry and Kem bites his finger off. Kem then puts Mekt under arrest, and Star Boy and Sun Boy return to Legion HQ with Mekt's loaner Legion ring, which they took back when he was arrested. Sun Boy and his group, Terra Firma, rejoin the Legion, and brainy reveals that the Wanderers left as soon as they found out Mekt was arrested. Brainy then confesses that, having never trusted the Wanderers, he tapped into Gozzl's computer systems as soon as they arrived, discovering that it was Mekt's idea to destroy the Dominator homeworld, and he used Jeyra to implant the suggestion into Cosmic Boy's mind. As such, Cosmic Boy is cleared of all charges and Mekt is now charged with the Dominator genocide. We then get a brief glimpse of where search team 2 is... planet Lallor, flames everywhere, and there's... someone.... in a helmet... with a winged star on their chest... standing in the fire. And the Legion thinks this means they have bad luck. Who is that? Should I know? Is it a mystery? Help me out here, people! Story - 4: There's a lot in this story that doesn't add up. If Vrax made the nano-tech that brainwashed (and gave powers to) the people of Winath, and did it on Mekt's orders... why would Mekt want him to do that? I'm not seeing the motivation there, but I'm hoping that will be revealed in issues to come. It also seemed to come out of the blue to me that Mekt would suddenly think Tenzil Kem was somehow involved in the modifications to his parents. Why would he think that? What is he basing that decision on? The only possible explanation I can see right now is that Mekt did, indeed, put Vrax up to making the modifications to his parents and the others, and this was a bad attempt at a case of misdirection on Mekt's part. If so, then it's great. If not, then it doesn't really make any sense. I love Tenzil Kem as the kickboxing lawyer version of Matter-Eater lad. What I want to know is how did I not see this coming? "Kem"? The glasses? DUH. All the signs were there, and yet I completely missed them. Why? But let me tell you, that made for a particularly enjoyable reveal when Kem ate his way out of the grain silo. And biting off Mekt's finger? Ah, good times. Still no Kara, sadly, for two months in a row. Hopefully next issue has plenty of her, especially since I don't think she's going to be around with the Legion all that much longer and I'd like to see her interacting with them as much as possible. Art - 5: As with last month, I thoroughly enjoyed Calero's style and realism. And the facial expressions at the top of page 19, right after Kem has bitten off Mekt's finger? Cover Art - 4: I'm curious about this cover. I'm curious as to why Saturn Girl is on it, when she has absolutely nothing to do with this issue and doesn't appear within 50 miles of it. This is an ongoing issue with the Legion covers, and I really don't understand it. My queries as to the reasons behind his have been met with only whispers on the wind. Personally, I suspect it's a conspiracy. By the Dominators. Yeah, the Dominators. That's the ticket. I'm curious as to why Star Boy is bald on the cover, when on the interior he... isn't. I'm curious as to why Sun Boy has longer, flowy hair on the cover, when on the interior it's very short and close-cropped. I've got it! Saturn Girl also doubles as the Legion barber, and these are Star Boy's and Sun Boy's new do's and this is just a preview of the wacky things to come in "Saturn Girl: My Crazy Barber Teammate", coming this fall to CBS. Genius cross-promotion, I tell you! What's that? CBS isn't airing that show, you say? Well what OTHER reason could there be for this cover then? Got any ideas? I'm fresh out.